Join us for this delightful exhibition of one of Australia’s most highly regarded authors and illustrators in celebration of Josephine springing to life on stage during our Spot On Children’s Festival. 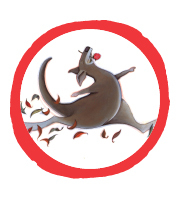 Since 1992 Bruce Whatley has written and/or illustrated over 80 children’s picture books published both in Australia and overseas many created with his wife Rosie Smith. He has also worked with author Jackie French on Diary of a Wombat, Pete the Sheep and of course, Josephine Wants to Dance. Curated by Bruce himself, this exhibition will take you on a visual journey featuring some of your favourite characters from Josephine through to Ruben. Open Box Office hours and one hour prior to performances. Please confirm exhibition times with Box Office on 8839 3399. Bruce jumped into the unknown world of picture books after a career in advertising as an Illustrator and art director working in London then Sydney. Since 1992 Bruce has written and/or illustrated over 80 children’s picture books. Though based in Australia his work is published internationally and in 2014 was included in the Bologna Children’s Book Fair Exhibition. His award winning titles include The Ugliest Dog in the World, Looking for Crabs, Detective Donut and the Wild Goose Chase, Diary of a Wombat, The Little Refugee, Flood, Fire, And the Band Played Waltzing Matilda and Cyclone. His main inspiration has been his family, who feature in several of his earlier picture books, his wife Rosie Smith being co-author on many of his projects. He uses a variety of illustration medium including gouache, pen and ink, pencil, oils, watercolour and more recently CGI software. His aim is to entertain and surprise the reader with illustration styles that vary considerably depending on the text and the age group of his audience. Bruce completed his PhD, in 2008 Left Hand Right Hand: implications of ambidextrous image making looking at the image making of the non-dominant hand discovering that in most people the ability to draw lies in using the ‘other’ hand. He has since illustrated 3 books with his non-dominant left hand. Bruce is continually looking for new innovative ways to make images to tell his visual narratives.